Christmas Inflatable Santa Stop Sign with Lights Blower Airblown CSA 4ft (1.2m) Can be used indoor and outdoor. 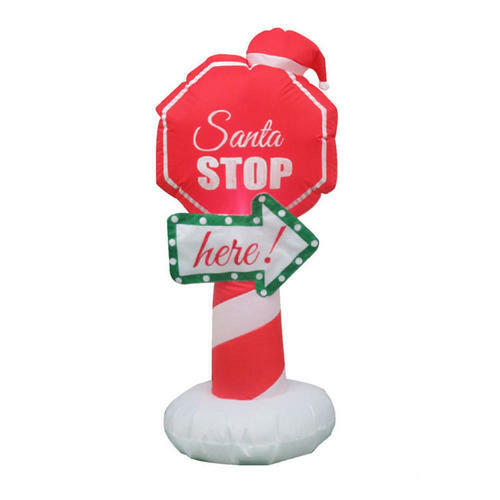 Blinking stop sign inflatable will bring your yard to life this Christmas and New Year Party.3 Size: 4ft (1.2m) Adapter included. Wire length: 6Ft (1.82m) Can be used indoor and outdoor, UL listed. Self inflates in seconds. Lights up for nighttime use. Made from a weather resistant material. Everything is Included for an easy setup.